Material: That from which something is made. Efficient: That by which something is made. 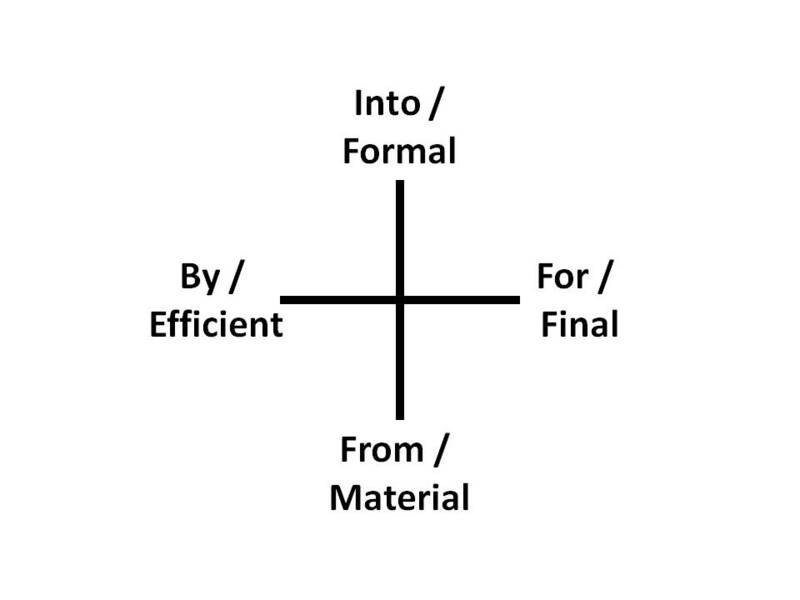 Formal: That into which something is made. Final: That for the sake of which something is made. Aristotle’s Four Causes is likely the most familiar of all the double duals that I will present. The causes are closer to being “becauses” since they are usually thought of as the reasons or explanations for things. Why not call them the four prepositions? The standard example of the four causes is what is needed for the building of a house. A house is built by the craftsmen, from the raw materials, into the form shown on blueprints, for the homeowner to live in. This and other usual examples are concerned with the making of something. Formal and final causes have gotten the short shift since the beginning of the scientific revolution. Francis Bacon stated that the only scientific reasons for things were the efficient and material causes. For those critical of materialism this is often termed mere “matter in motion”. Matter can be thought to exist in space, and motion in time. Where does form or finality exist? I will say in space and time as well. Max Hocutt / Aristotle’s Four Becauses, in Philosophy, Vol. 49, No. 190. (Oct., 1974), pp. 385-399. John Sowa’s Thematic Roles: initiator, resource, essence, goal. This entry was posted on August 12, 2010 at 4:50 PM and is filed under Aristotle, epistemology, Philosophy, Space and Time. You can follow any responses to this entry through the RSS 2.0 feed. You can leave a response, or trackback from your own site.